Joseph Blackman, a Miami-Dade County mosquito control inspector, at work in Miami. Mosquitoes infected with Zika are now spreading the illness in at least four different parts of the city, according to federal health officials. 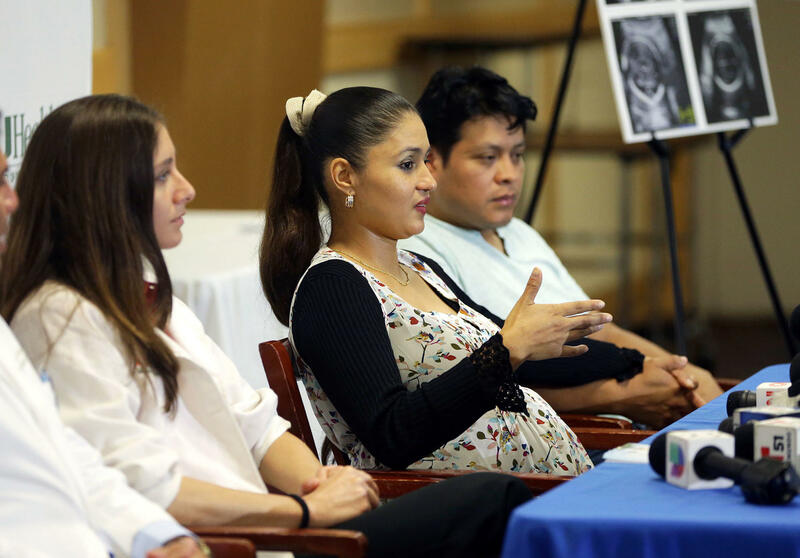 Yessica Flores (center), who became infected with the Zika virus early in her pregnancy this summer, told Miami reporters this week about her worries. The fetus looks healthy so far, doctors say. Flores and her husband, Selvin Yac (right), will name the baby Daniela Elizabeth. In Miami on Tuesday, the head of the Centers for Disease Control and Prevention, Dr. Tom Frieden, delivered what he called the "plain truth" about Zika and the mosquitoes that carry it. "Zika and other diseases spread by Aedes aegypti," he said, "are really not controllable with current technologies." The CDC has upgraded its Zika-related health advisory for Florida. The agency says it now believes there's a risk of local transmission in all of Miami-Dade County. It's advising pregnant women to avoid areas in the county where local transmission is taking place and to consider postponing travel to all parts of the county. Pregnant women are considered most at risk for Zika, because it has been linked to microcephaly and other birth defects. Yessica Flores remembers the day she was told she has Zika. She's 38 years old and was in her fourth month of pregnancy when tests for Zika came back positive. "It was very hard to hear that," she says, "and I asked God for help. The doctor asked me to calm down — everything always has a solution." Doctors aren't sure where Flores contracted Zika. She works at a school in Miami's Wynwood neighborhood, an area where mosquitoes have spread the virus. She also had recently visited her native Honduras, where Zika is being locally transmitted. So far, regular ultrasounds show her baby girl is healthy. Her head is growing normally and there are no signs of problems. Flores and her husband already have a name: Daniela Elizabeth. Flores says she's relying on her religious faith. "God is giving me the strength to keep going," she says. Flores is one of more than 110 pregnant women who have tested positive for Zika in Florida. Her physician, Dr. Christine Curry at the University of Miami, says fighting the disease is about more than just treating pregnant women. Nearly three months after mosquitoes were determined to be spreading Zika, the virus continues to infect people in Miami. "It is disappointing that there continues to be transmission," Curry says, "though I think it's not surprising, given our environment and the mosquitoes that we have in our area. But it certainly speaks to the fact that [we cannot have] a waxing and waning interest in prevention." This month, a fourth area was identified in Miami where Zika is being transmitted locally — in Miami's Little River neighborhood. At a recent roundtable discussion on Zika in the neighborhood, Miami-Dade Mayor Carlos Gimenez said: "We're confident that we're going to get it under control in Miami Beach. And we're confident we're going to get it under control here in the Little River area." So far, local officials in Miami have successfully cleared just one zone of local Zika transmission — the Wynwood neighborhood. 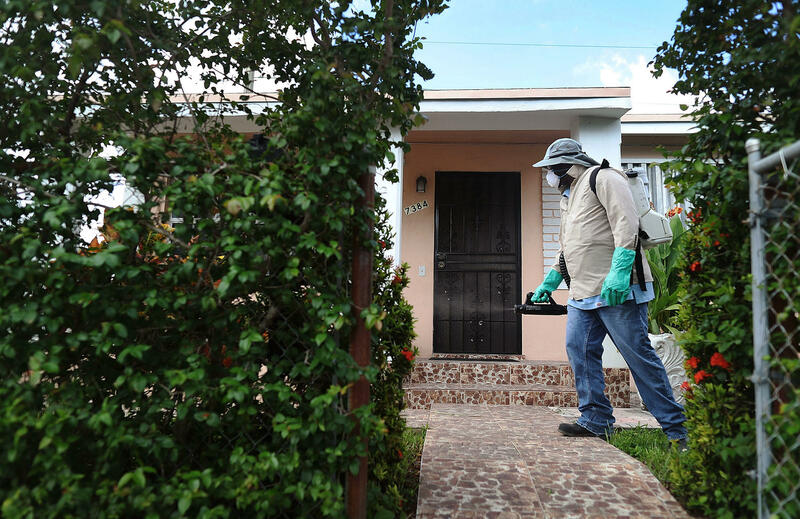 In Miami Beach, despite intensive mosquito control efforts, including aerial spraying with the chemical insecticide Naled, new Zika cases forced health authorities to triple the size of the zone. This month, after weeks of treatment, a trap showed new mosquitoes still carrying the virus. That has led activists and some scientists to question the effectiveness of the aerial spraying. Gimenez says Naled worked, when used in combination with Bacillus thuringiensis israelensis, or Bti — a naturally occurring soil bacterium that can be deployed to kill the mosquito larvae that tend to linger in puddles of standing water. "We saw mosquito counts drop dramatically in the south sector where we did it," Gimenez says. "We saw mosquito counts drop and remain low in Wynwood. So, it's definitely effective." What makes Zika so hard to control is the mosquito that carries it. After many centuries of living in proximity to people, Aedes aegypti mosquitoes have adapted. They hide in closets and under tables and in foliage — places where spraying often doesn't reach. Especially in an area with high-rise buildings, like Miami Beach, aerial spraying is not considered effective for A. aegypti. For that reason, federal and state health officials initially ruled it out. But as Zika cases multiplied, they decided to try a targeted spraying campaign. Philip Stoddard is the mayor of South Miami. He's also a biologist at Florida International University. He used the county's data to do a statistical analysis of the aerial Naled spraying and found it had "very little measurable and statistically significant effect" on Miami Beach's mosquito population, he says. The analysis shows that aerial spraying was more effective in Wynwood, Stoddard says, a neighborhood without high-rises. In both places, though, it was use of the bacterial larvicide, he says, that produced the long-term declines in mosquito population. "Certainly in the Beach," Stoddard says, "I would say the Bti is the only thing that seems to have done anything. You could have sacrificed goats and used Bti and seen a decline. But that's the Bti, not the Naled doing it." Tropical disease specialist Dr.Michael Callahan practices at Massachusetts General Hospital and is chief medical officer at the Zika Foundation. In his work with the U.S. government and international agencies, he has been fighting the A. aegypti mosquito for nearly 20 years. In his work around the world, Callahan says, spraying a chemical pesticide like Naled is a last-ditch solution. It works best, he says, if done at street level and during the day — neither of which was the case in Miami. With declining temperatures and humidity, Callahan expects to see fewer Zika cases in Florida in the months ahead. But he has a chilling warning for people in Florida. "Unfortunately," Callahan says, "in all of our Zika mosquito control efforts in southeast Asia, West Africa and here in the tropical Americas, once the virus has entered the local Aedes mosquito populations, we've never been able to get it out — totally out." Zika is well on its way to becoming an endemic disease, Frieden says. That means, despite our best efforts, it may be here to stay. Health officials in the Miami area have spent months trying to contain the mosquito-borne Zika virus, but it is still spreading. And yesterday the Centers for Disease Control and Prevention Chief Tom Frieden said this. TOM FRIEDEN: Zika and other diseases spread by Aedes aegypti are really not controllable with current technologies. MCEVERS: Zika of course is linked to devastating birth defects. Here's NPR's Greg Allen. GREG ALLEN, BYLINE: Yessica Flores remembers the day she was told she has Zika. She was in her fourth month of pregnancy when she was tested in August. The tests came back positive. YESSICA FLORES: (Through interpreter) It was very hard to hear that. And I asked God for help. The doctor asked me to calm down. Everything always has a solution, she said. ALLEN: Doctors aren't sure where Flores contracted Zika. She works at a school in Miami's Wynwood neighborhood, an area where mosquitoes were spreading the virus. She had also recently visited her native Honduras where Zika being transmitted locally. So far ultrasounds show her baby girl is healthy, and there are no signs yet of problems. Flores is one of more than 110 pregnant women who've tested positive for Zika in Florida. It's been nearly three months since health officials confirmed Zika is being transmitted locally in Miami, and New cases are still being reported almost daily. St. Mary Cathedral School in Miami's Little River neighborhood is at the heart of Florida's newest zone of local Zika transmission. Miami-Dade Mayor Carlos Gimenez was one of several local officials who recently held a Zika roundtable discussion at the school. CARLOS GIMENEZ: We're confident that we're going to get it under control in Miami Beach, and we're confident we're going to get it under control, too, here in the Little River area. ALLEN: But so far local officials in Miami have successfully cleared just one zone of local Zika transmission, the Wynwood neighborhood. In Miami Beach, despite intensive mosquito control efforts which included aerial spraying with the controversial insecticide Naled, new Zika cases forced health authorities to triple the size of the local transmission zone. This month, after weeks of treatment, a trap showed new mosquitoes carrying the virus? That's led some to question the effectiveness of the Naled spraying. Gimenez says used in combination with a treatment that targets mosquito larvae, Naled lived worked. GIMENEZ: We saw mosquito counts drop, you know, dramatically in the south sector where we did it. We saw mosquito counts drop and remain low in Wynwood. ALLEN: But Zika is very hard to control, and it's largely because of the mosquito that carries it. Aedes aegypti mosquitoes hide in closets and under tables, places where spraying often doesn't reach. Especially in areas with high-rise buildings like Miami Beach, aerial spraying is not considered effective for Aedes aegypti. Federal and state officials initially ruled it out but, as Zika cases multiplied, decided to try it. Philip Stoddard is the mayor of South Miami and also a biologist at Florida International University. He used the county's data to do a statistical analysis of the aerial spraying. PHILIP STODDARD: My analyses so far have found very little measurable and statistically significant effect from Naled on the Beach. ALLEN: Stoddard says the data show aerial spraying was more effective in Wynwood, a neighborhood without high-rises. In both areas, though, his analyses showed it was the use of a larvicide, a bacteria known as Bti, that produced the long-term declines in mosquito population. STODDARD: Certainly in the Beach I would say the Bti is the only thing that seems to have done anything. I mean you could have sacrificed goats and used Bti and seen a decline, but that's the Bti, not the Naled doing it. ALLEN: Tropical disease specialist Michael Callahan, chief medical officer at the Zika Foundation, has been fighting the Aedes aegypti mosquito for nearly 20 years. He says with declining temperatures and humidity, Miami is likely to see fewer Zika cases in the months ahead, but he has a chilling warning for people in Florida. MICHAEL CALLAHAN: Unfortunately in all of our Zika mosquito control efforts in Southeast Asia, West Africa and here in the tropical Americas, once a virus has entered the local Aedes mosquito populations, we've never been able to get it out - totally out. ALLEN: Which means despite our best efforts, Zika may be here to stay. Greg Allen, NPR News, Miami. Transcript provided by NPR, Copyright NPR.